A love story between a Bracadyte Prince and a Great White Shark! 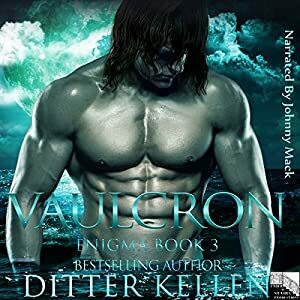 Vaulcron is #03 of 09 in the Enigma Series by Ditter Kellen. All 9 are currently published with 05 of them being in audio. The author plans for the other 4 to be in audio by the end of the year. She also plans many more after #09 at this time. Which excites me to no end! Johnny Mack narrates the series, to include all future editions. These are connected by characters so I recommend reading the books in order. It is more enjoyable that way, but could be taken as standalones if you absolutely insist. There would be spoilers for the earlier ones if you start in the middle. Mallory Cahill is a second generation reporter who knows the truth about the virus, but doesn’t have the proof needed to bring down those responsible. She just had the story of a lifetime and her proof dropped into her lap. Vaulcron, a Bracadyte, wants to meet and set the story straight about his people. Mallory can’t believe her luck or the immense attraction she feels for him. She quickly realizes how false all the reports are about the Bracadytes and vows not to give away their location. Vaulcron is older brother to Hauke and Naura from books #01 & #02. He has felt the pull to the one they call a shark since he first saw her on the news in the last book. He wants to make peace with humans and keep his people safe, and so reaches out to the human reporter for help. After they are abducted by the military, he vows to keep Mallory safe as well as make her his! Time, location, and family are not all on their side. Mallory needs to protect her sister, who has her senses set on a Bracadyte of her own. (I say senses because Amy is blind) Vaulcron wants to protect Mallory from those that seek to harm her just to get to him. The Vice President wants to protect the American population from the insanity that is the President. The human citizens as a whole just don’t want to die from the virus that is at large regardless of where it came from. So as you can see, there is more excitement to be had in Book #03! There is so much more I want to say, but can’t without spoiling something. The list of people I want to stab in the face has gotten longer! I will defiantly have some rants for the Read Along With Me, so look for it over there hopefully soon. This is my 4th read/listen by Ditter Kellen, and I can’t wait for #04! Her characters are ones I now hold dear and it’s Zaureth’s book! This cover is the HOTTEST! This is my 6th listen by Johnny Mack, and I would like to formally thank him for pronouncing Mobile correctly! Heard it done incorrectly before and it was like nails ok a chalkboard. Fixing a broken soul is harder than you think! 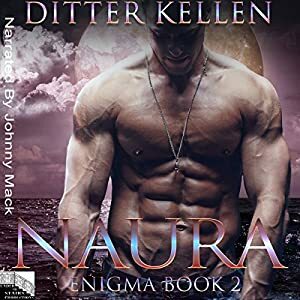 Naura is #02 of 09 in the Enigma Series by Ditter Kellen. All 9 are currently published with 05 of them being in audio. The author plans for the other 4 to be in audio by the end of the year. She also plans many more after #09 at this time. Which excites me to no end! “Every day until I draw my last breath”. Naura is sister to Hauke from Book #01 which makes her a princess of the Bracadytes. She took blood from Tony in that first book, therefore linking her to him forever. During this exchange, she bared witness to his memories of the horrible way his wife and son were taken from him. It is against the Bracadyte law to take blood from humans as it is also a no-no to mate with one. Hauke and Abbie barely got around this, but Abbie has to forever stay in Aukrabah. Naura knows Tony will never agree to this, but wants Tony anyway! Anthony “Tony” Vaughn is Abbie’s Uncle and an ex-CIA operative. His former employment is what has led to the demise of his family, his near non-existence in the human world, and some “connections” that always seem to know what is going on behind the scenes. Tony wants Naura but fights it at every turn because he feels broken beyond repair. 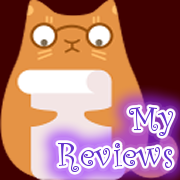 He worries that karma is determined to make him pay for the deeds of his past. Naura and Tony are joined by all the characters from Book #01 that, if you have been listening in order, should of grown to love. Braum’s clever deceptions are to be commended. Gryke’s bumbling of common human phrases are hysterical. Vaulcron’s obsession with the “Great White Shark” reporter leaves much to look forward to. I can’t wait until I can get to listen to their HEA stories! “Chicken,” Naura taunted with a grin. The couple this time around face challenges on the personal level as well as the outside world that all seem to be stacked against them. There is more to be learned about the virus, as well as some secrets being kept by those that are trusted. Book #02 matches Book #01 in the action department and will not let you down. I am glad this series is going on my Read Along With Me list because I really want to comment without spoiling something. I got a lot to vent about Henry! I really don’t like him! Look for it over there hopefully soon. 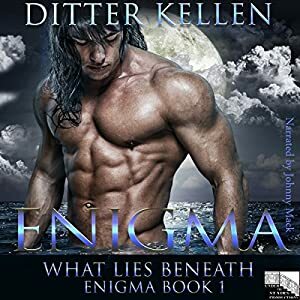 This is my third read/listen by Ditter Kellen, and I still want more! Her characters are ones to hold dear and her writing is imaginative and unique. The covers are still HOT! This is my fifth listen by Johnny Mack, and I’m glad he will be voicing the rest of the series! I am coming to associate the characters in this story with his voices. What Lies Beneath is #01 of 09 in the Enigma Series by Ditter Kellen. All 9 are currently published with 05 of them being in audio. The author plans for the other 4 to be in audio by the end of the year. She also plans many more after #09 at this time. Which excites me to no end! Every fan never wants their series to end! “Enigma,” he finished for her. Doctor Abbigail Sutherland knows her dad is up to something and follows him to work to find that the answer is more than she could of imaged. A human-like specimen is in the lab, waiting to be retrieved by the military. Abbie feels drawn to this creature but cannot fathom why. He seems familiar for some reason. Hauke is a type of alien merman, for lack of a better word. The last thing he remembers is searching for his sister and brothers in arms after an explosion. He wakes in the lab to the sounds of Abbie’s voice and mentally links with her and shares the memories of their past encounter. After an infusion of human blood, Hauke is miraculously back from the dead just in time for all hell to break loose. The pair turn to Abbie’s uncle for protection. Uncle Tony is an ex-CIA operative who is a ghost. Seriously, he basically never existed due to his past government relations. With Tony’s help, they manage to get Hauke home under the sea. Take note of Uncle Tony, because you will see him again! “Te amo’?” she questioned through their link. There is a lot of action to be had, as well as more characters to meet and fall in love with. The overall story Arc of the Bracadytes and the infection will continue throughout the whole series. Ditter Kellen weaves mythology into a uniquely beautiful story that is the world of the Bracadytes. The characters are fictional but will illicit real emotions. You will want to rise up on their behalf to protect them from the human ignorance that threatens their well-being. The Enigma series has quickly become one of my favorites! I can’t wait to listen to the next as I devour this series like candy. I want to know how every character’s story plays out! I can’t really comment more without spoiling something. And trust me, there are things I want to say about some of the people I want to stab in the face, lol, but I will have to make this series a part of the Read Along With Me titles, so look for it over there hopefully soon. This is my second read/listen by Ditter Kellen, and I can’t get enough! Her writing is imaginative and unique! The covers are HOT!